Jeff Brown encourages us to Remember the Alamo, which marks its 180th anniversary this year. Not only does Jeff regale us with a concise account of the events of February-March 1836, accompanied by useful maps, he goes one step further and provides cardboard cutout buildings to recreate the battle! The PDFs can be downloaded from our website here free from official publication day next week. We're delighted to see the return of Alistair Birch who was given the curious task of interviewing his own brother! Dig out those 1:72 plastic Germans, fire up your StuGs and glue the rockets back on your Sherman Calliope – Airfix Battles is coming to conquer a tabletop near you. Al gets an in-depth interview with Chris Birch of Modiphius who designed the game. In Enter the dragon, we chat with Daniel Mersey, author of the popular mid-range medieval ruleset Lion Rampant, who has now followed up that success with a fantasy version aimed at intermediate-sized games. Graham Burke returns with a brace of exciting scenarios that can be played with any of the popular Dark Age rulesets, in which some of the best-known figures of the age can be represented, with maps and force lists for the battles of Burford and the River Idle. 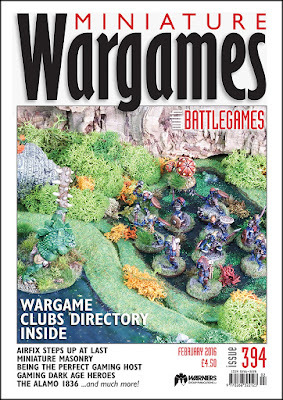 The Editor has been sending out hundreds of emails and the result is an up-to-date directory of as many of the U.K. wargame clubs as it was possible to fit in before the deadline! Big thanks are also due to the Gaming Club Network who kindly helped out with a list of their members. We'll be publishing this online in due course – so if your club has been missed, get in touch and we'll add you online. We have a show report too: Neil Shuck attended Hereward towards the end of last year, and has supplied a bevy of pretty pictures of the games in action – bathed in light! 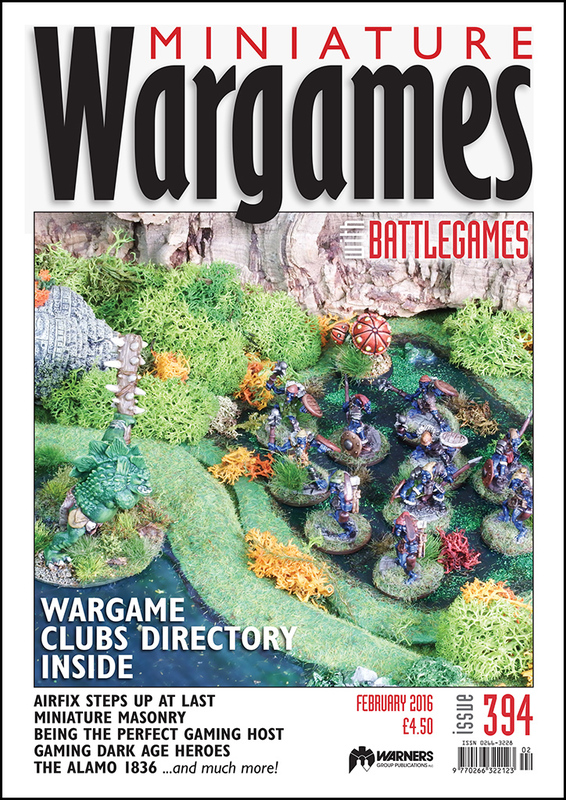 The Editor provides a reminder of the many wars for which we could be commemorating centenaries this year in his Briefing; in his World Wide Wargaming, he shows how he created a step-by-step painting and basing tutorial on Twitter as a way of keeping a project 'on course', as well as lauding another pair of 'Blogs of the Month'. Neil Shuck has been getting very excited about a recent clutch of Ancients rulesets, as well as revealing aspects of his own hobby time, including painting, basing and bridges. Diane Sutherland has been carving up cardboard to recreate period stonework and never tiring of tiling, showing how selective titivation can enhance your wargame scenery. In Fantasy Facts, having fought his way out of his packing case bunker, John Treadaway is currently living in an internet-free zone, something of a setback for a high-tech man about town, but no barrier for our determined correspondent who sends a solid report about the latest goodies in the fantasy and sci-fi worlds. Boardgame specialist Brad Harmer-Barnes uses his Hex Encounter to explore a number of games designed to recreate the experience of JRR Tolkien's epic tale of hobbits, dwarves, elves and men. In his Send three and fourpence column, Conrad Kinch, who is always our go-to correspondent for social niceties, recommends five time-tested steps to hosting a successful wargames night at home. Of course we have our Battlegames Combat Stress Appeal which includes a brief farewell to one of the staff at Combat Stress HQ, and our highly respected Recce section reviews all manner of books, rulesets, and other wargaming stuff – even playing cards! We also announce that places are still available for the third Featherstone Annual Tribute to be held at the Wargames Holiday Centre near Basingstoke, this year featuring the enormous Battle of Leipzig 1813. Finally, our competition this month features no less than five copies up for grabs of Daniel Mersey's Dragon Rampant fantasy rules, with thanks to Osprey for their generosity. The front cover features a photo taken by the Editor for the Dragon Rampant rulebook. Remember also to check out the Goodies section on our website after publication date next Friday for those Alamo downloads! New League of Augsburg available for pre-order! Pendraken Miniatures, "230 Releases in 2015!"